All and Sundry: Perceiving old age: Non-existent complaints: 20,000-volt Tesla coil lightning-blasting Nerf gun: Dog-sheep: and a rubbish motor. Perceiving old age: Non-existent complaints: 20,000-volt Tesla coil lightning-blasting Nerf gun: Dog-sheep: and a rubbish motor. Usual lack of warm, just as much solar stuff, quite a lot of atmospheric movement and gallons of evaporated skywater at the Castle this morn, just returned from the stale bread, gruel and his Maj’s food run dahn Tesco, the place was awash with interweb robots and one actually managed to crash into me while I was stood still trying to choose which flavour Dreamies to purchase for himself. We think that we become old farts at 59 years, two months and two weeks; government researchers interviewed 2,162 Blightyites to determine this crucial “fact”. And allegedly the age of no longer being young starts at 40 years, eight months and two weeks. On average, women think old age starts at 60 years, four months and two weeks. Men think it starts at 58 - potentially because they tend to live shorter lives. Those under 50 say old age begins staggeringly early - at just 46. 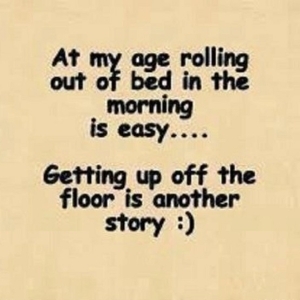 But for those over 50, they say it begins at 62-and-a-half. Those living in council housing say old age begins five years earlier than those who own their homes. And the unemployed say middle age begins a huge nine years earlier than those in full time work. Men believe they stop feeling young early than women do, at 38-and-a-half rather than 42 years and nine months. Among 16 to 24-year-olds, this marker of middle age begins at 32. 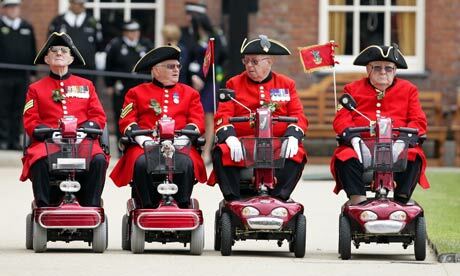 The over-80s believed that for them it began at 52 - just two years after the youngest group believed old age begins. 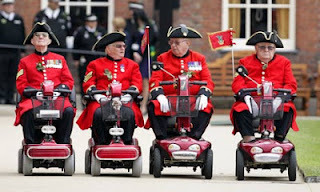 A spokesman for the Department for Witless Pillocks said “the disparity in perceptions” of ageing showed “the potential for age stereotypes to be applied in very inconsistent ways". Film classification chiefs have seen "a spike" in the number of people complaining about a controversial film portraying Jesus and his disciples as gay men - even though it does not exist. The British Board of Film Classification's (BBFC) senior examiner Craig Lapper said there was a "constant issue" with rumours that a movie version had been made of a controversial play called Corpus Christi. The play, by Terrence McNally, is set in modern-day America and deals with issues including gay marriage but has never been made into a film. 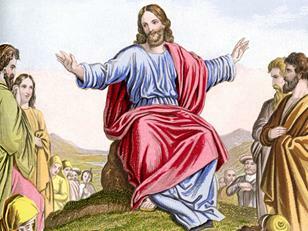 Mr Lapper said: "I think it was a bit of an internet hoax several years ago suggesting a film was being made of the play in which Jesus and his disciples were portrayed as homosexuals, and I can remember replying to people concerned about this blasphemous film back in the late 1990s. "And this year again, for whatever reason, there was another spike in people writing to us to insist that we ban this terrible blasphemous film. We just had to write back and say, 'This film doesn't exist'." The BBFC received six complaints about it in 2011 and another two queries this year, with complainants often asking them to ban the film on the grounds it is blasphemous and offensive. US basement hacker Rob Flickenger has “invented” a 20,000-volt Tesla coil lightning-blasting Nerf gun. After brushing up on his physics using online MIT courses, Flickenger, through trial and error, setup the interior circuits. "I'd switch it on, and nothing would happen, so I'd switch it off. Then I'd switch it on again and set something on fire," he told Popsci.com. In the end he used the transformer from an old television -- the current from an 18-volt lithium-ion battery flows through a circuit series over and over again, doubling the power each time. It then flows into a Cornell Dubilier capacitor bank, which stores it until it reaches 20,000 volts -- at this point, the current can jump between two tungsten wires, creating a spark (this part is housed in porcelain and a computer fan is fixed nearby to make sure it doesn't get too hot). The current jumps from one wire to the next, then feeds through to one coil (insulated high-voltage wire), then the next (plumbing pipe wrapped in copper wire). This process induces a magnetic field, which in turn creates an electrical field at the gun's nose and finally, the bursts of electric blue lightening. It took him nine months to build and was made using cheap everyday objects like old cans, an old TV and a lithium-ion battery from a drill. The total cost came to around $800 (£500) and, after nine long months tinkering away at it, Flickenger debuted the lightning bolt gun at his wedding reception. Timmy the sheep thinks he’s a dog. He even sleeps in a kennel and goes for walkies. Timmy was rescued by farmers Samantha and Eric Perry after being orphaned when he was just few days old. 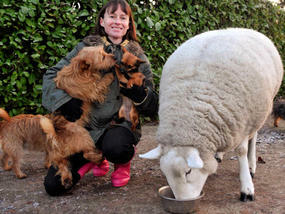 He bonded instantly with the couple’s dogs while being bottle-fed at their home in Aston-on-Trent, Derbyshire. Samantha, 42, said: “Timmy definitely thinks he’s a dog – he always has. Timmy, who is 18 months old, was brought up with Yorkshire terrier Poppy, Shih tzu Daisy-May, terrier Tyson, Jack Russell Sapphire, and Jack Russell cross Barney. Now weighing 200lb, he has a new pal, Pandora, a tiny Chihuahua. 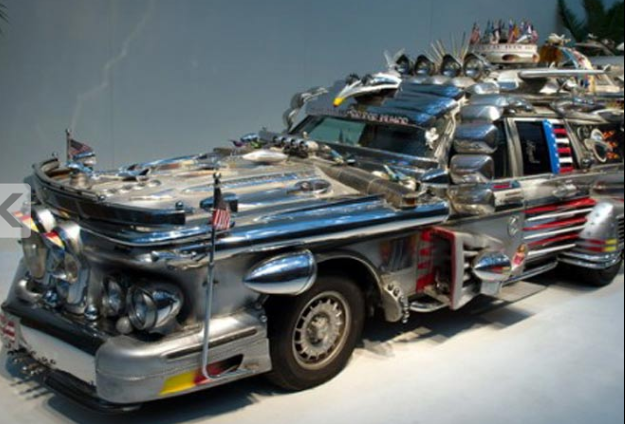 According to the owner, this pile of bits is worth a million Dollars, Antti Rahko's scrap metal stretch limo, the Finnjet, was insured for a million for its trip to star in the recent Essen Motor Show in Germany - and will likely have a similar asking price when it goes up for sale shortly. Rahko, a former chauffer from Finland now living in the US state of Florida, spent 10 years building the Finnjet from scrap parts grafted onto a platform from two Mercedes-Benz 300TD station wagons. It stretches over eight metres long and weighing in at 2.78 tonnes - and just in case that size isn't enough to catch your eye - the bizarre behemoth sports 86 lights, 36 mirrors and two natty jet engine housings containing the exhausts. Ten years to build a million dollar car sounds like a good deal to me.